So you want to make some potions, do ya? You think you have what it takes to prove yourself worthy of the position of arch-potion-master? Well, get in line, so do a bunch of other people. There can only be one, so now we have to have a contest. Prove your worth, young potion maker. Collect your ingredients and brush up on your spells, because this is a hectic race to the finish line. Who can power up their potions and achieve the ultimate level of Magik first? Only time – and a game of Cauldron – will tell. 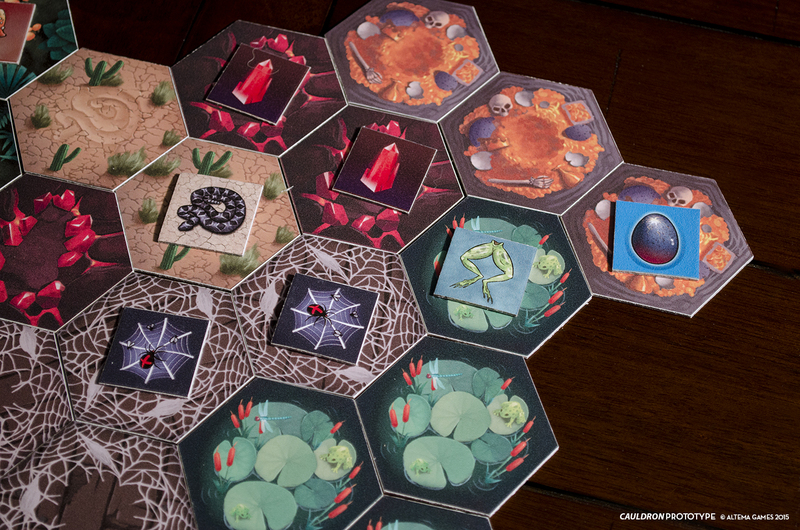 Note: this is a preview of a non-final prototype of Cauldron, which is now on Kickstarter. Components, art, and rules are subject to change. In Cauldron, players are competing to brew powerful potions, which generates Magik. Magik can be used to purchase new potion recipes and spells, but it’s also what you need to prove yourself the master of potions – the first to 35 Magik is the winner. Each round of the game is broken into two phases: Harvest, and Market. In the Harvest phase, an Omen card is revealed which has some global effect, and a new first player is determined by rolling dice. Then, players take turns performing one action at a time. You can harvest an ingredient from the board, brew a potion with the ingredients you have, or attempt to steal an ingredient from another player. While harvesting is an automatic success, stealing requires a die roll with a 50-50 chance of succeeding. If you fail, you waste an action, too bad. When you brew, you discard the correct ingredients and gain Magik according to the potion card. However, you do NOT discard the Potion card – it’s a recipe, so you can brew the same potion repeatedly to continue scoring points. You can also do a variety of “quick” actions on your turn during the harvest. These quick actions include playing Spell cards, moving your ingredients into cellars (which protects them from both getting stolen and expiring later on), and brewing “Quick-brew” potions. These quick actions can be performed in addition to you single full action on the same turn. At the end of Harvest (when someone takes the last ingredient from the board), everyone must discard any remaining unused ingredients (because they spoil). In the Market phase, each player gets a chance to purchase one thing. 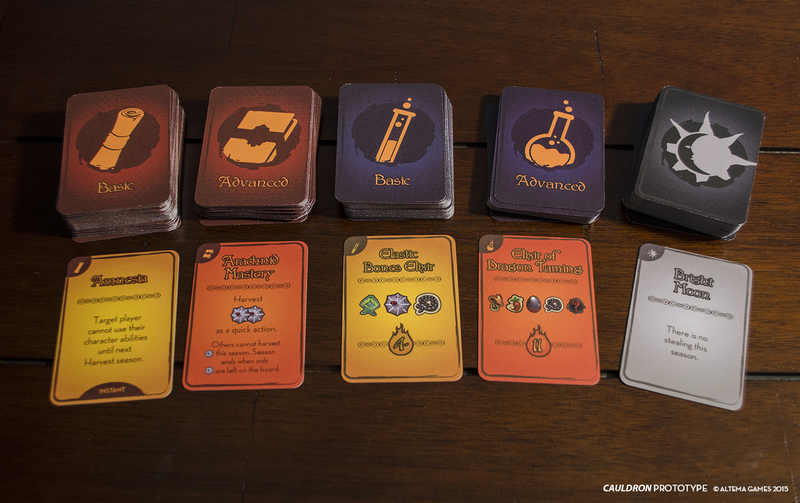 The options for purchase include spells, potions, and new fields that produce ingredients. You can also purchase cellars. Later in the game you can also purchase advanced spells and potions at a higher cost. Of course, you have to use Magik to buy things, the same stuff you need to win the game. Each player also has a unique character with two powerful abilities they can utilize the help win the game. The game ends when someone hits 35 Magik points. 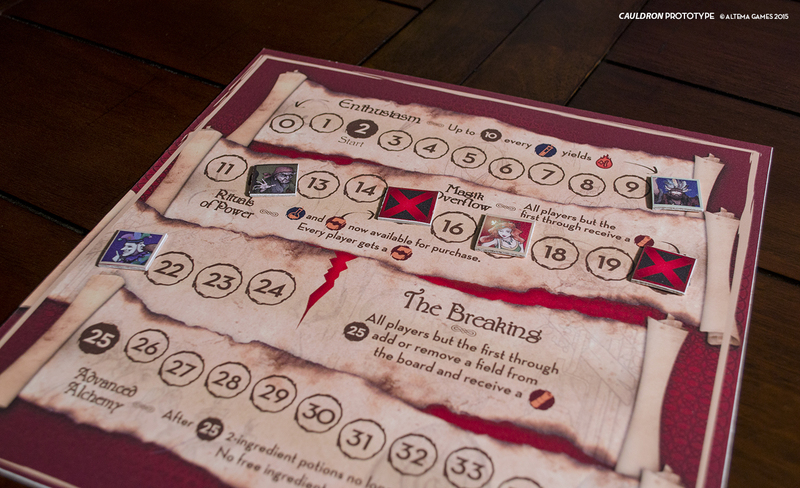 Alchemy seems a popular subject for board games, with a number of recent entries into the genre, including Alchemy!, Alchemists, and… uh… Viva Java. 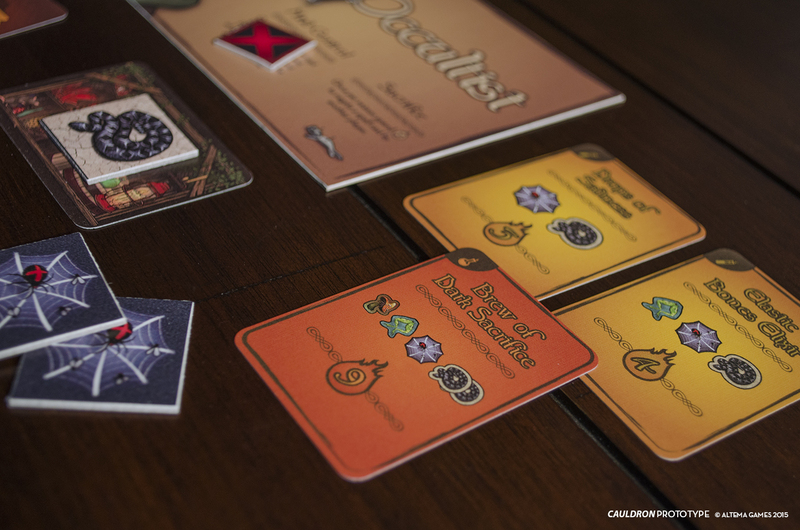 Cauldron falls on the lighter end of the spectrum, favoring fast paced gameplay, simple actions, and lots of interaction over complex formulas and engine-building. The core gameplay is streamlined; you just take an ingredient you need. The trick is getting ahead of the other players. So, you have to balance just taking what you need when it’s available and trying to steal, risking a wasted turn in order to gain something for yourself as well as slow another down. Fortunately, you have an opportunity to pick up some cellars to protect your goods from thievery (some of them, anyways). Attempted stealing has the side effect of extending the Harvest phase, and given the limited number of turns each round, more time can mean an extra potion brewed. Spells add to the chaos, and are key to victory. Spells are basically action cards, and they can make it easier to steal (or protect from stealing), gain extra resources for free, gain free cellars, and more. Playing one at the right time can give you just the boost you need to push ahead. The Market phase is where strategy comes in. Since you can only buy one thing, you’ve got to make it count. New potions are expensive, but broaden your horizons with more opportunities to use up all those ingredients. A wider variety of potions might mean you can keep brewing with leftover ingredients that no one else wants. Plots are key to getting ingredients, some of which don’t even start on the board – and to attract you further, you get a free resource from the plot you buy, when you buy it. Cellars are incredibly useful to maintain ingredients from turn to turn, and protect them from stealing. And, of course, spells are incredibly useful, although they don’t always directly get you points. You have to make a tough choice about what you buy, because everything is so very important. On top of that, the use of Magik as both victory points and currency makes this simple system even more tense and interesting. There is an advanced variant that lets you buy 2 things each Market phase, and that just adds a bunch more choices. The player powers are actually very cool, and quite powerful. These are the sort of powers that seem completely unfair, but everyone has a completely unfair power and it all seems to balance out in the end. In fact they really take the game up to the next level, and if you can leverage your own power to its maximum effect it drastically increases your chances of winning. I hate powers that you have to wait to use, that require specific conditions that may or may not happen. Often you never even get to use those powers. Fortunately, these abilities are the sort you don’t have to hope will happen ; you can make choices and actively pursue paths that can activate your power. One power gives you a bunch of extra spells; another lets you preserve ingredients by owning extra cellars, and re-use an ingredient once per turn. Still another lets you brew a potion from another player’s recipe each Harvest phase. All of these powers are fun to use. 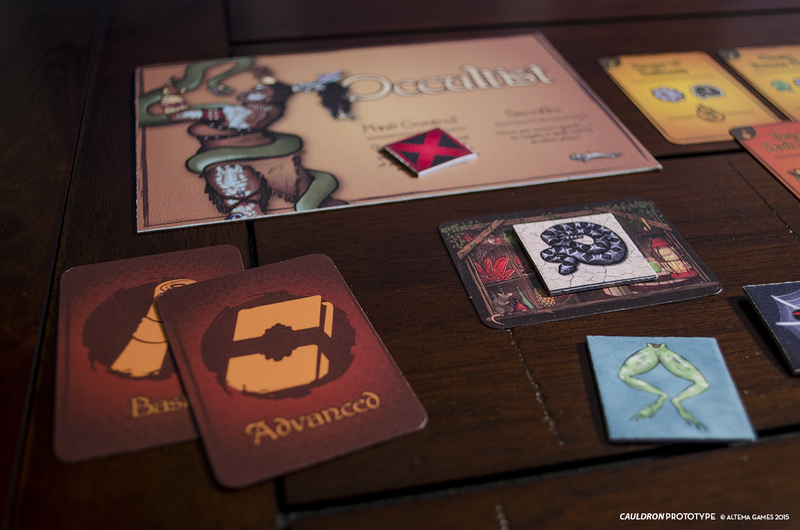 If there is one power that might be overkill, it would be the Trickster, who has much better odds of stealing, can take one Steal action as a quick action during the Harvest phase, AND attempt to steal from other players’ cellars (although at worse odds). Most of the powers help the player; but stealing helps yourself and hinders others. Utilized effectively, there aren’t a lot of protections against it. Then again, I haven’t played extensively enough to know for sure. All I know is, all the powers seem pretty fun to use. The game also has a few built in balancing mechanisms to prevent a player from running too far ahead. Certain points on the score tracker unlock things that boost those who are behind. Once a player passes 10 Magik, everyone under 10 gains an extra Magik when they brew a potion. Later on, players get free spells when the leader passes a certain point, and advanced potions and spells are unlocked for everyone when any player reaches 15 the first time. There are a couple elements that are, shall we say, less than ideal. In each Harvest phase, the important and/or unique ingredients tend to get used up early on. Often, near the end of the round the remaining ingredients can’t be used by a majority of the players, which means people are taking stuff not because they need it or even to deprive others of it, but just because they have to take something. Only ingredients saved in cellars pass to the next round, so people tend to end up with a big stack of tokens they just end up discarding – they can’t even hold on to them in hopes of getting a new potion that CAN use it. (To be clear, I think the spoiling mechanism is an important one. It prevents someone from stockpiling a bunch of ingredients for a series of crazy-fast brewing later on). There’s also the matter that you can’t gain any new potions during the Harvest phase. Since some spells can steal potion recipes, it is entirely possible for a player to end up without any usable potions in the middle of a round. Again this can result in a player simply collecting ingredients without purpose, because they have no means to adjust. This is more likely to happen in later rounds, when 2-ingredient potions suddenly become unusable. My last concern is about stealing in the last few rounds of the game. As the game nears its end (which is easy to track thanks to the public Magik tracker) people tend to start attempting rampant stealing from the leader. And why not? The game just ends if he or she has the ingredients needed to brew their last potion. But if every player is trying to steal from you, the odds of losing ingredients goes way up. Your best bet is to buy spells in hopes to get some extra defense or something that will push you over the edge, but you can’t build up defenses or increase your efficiency over the course of the game so you just have to get lucky and hope no one succeeds at stealing (or you get the right spell card). At the very least, most Advanced potions are Quick potions, which means you can brew them the same turn you collect the final ingredient. So if you can get a spell that gives you extra ingredients or steal from other players or take an extra action or two, you CAN succeed eventually. I haven’t seen the stealing really drag the game on too long, either; it really just makes for a tense final few rounds as you try to get that thing that will seal your victory before someone else does. I just wish it relied a little less on luck at the end. 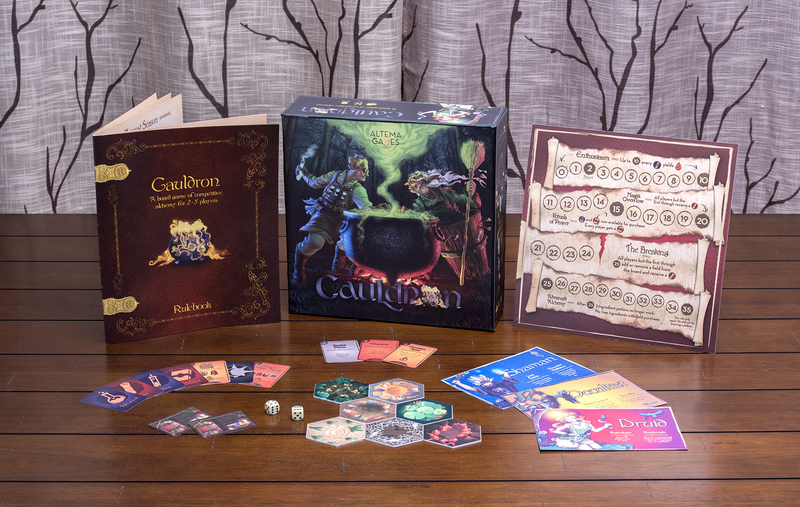 Whatever the case may be, Cauldron is simply a take-that sort of game, and if you know what you’re getting into you can certainly have a lot of fun with it. And maybe I just haven’t learned the best strategies for sealing up a victory for yourself. What I really like about this game is that you have a lot of agency, a lot of choice to make that will make a difference in the long run. Cauldron keeps the “take that” elements under control. Too many “take-that” games just have stupidly overpowered abilities that end up making your choices feel meaningless. “Take that” actions in this game block you, slow you down, or take something useful from you, but they don’t send you back to square one and they don’t happen so often that you can’t play the game. You will advance, you’ll do nasty things to everyone else, and the game doesn’t swing wildly from one end to the other. It has its twists and turns, but it’s active and interesting more than it is frustrating. This is what “take-that” should be. If you’re looking for a more euro-style game with resource management and engine building, you’ll have to look elsewhere. 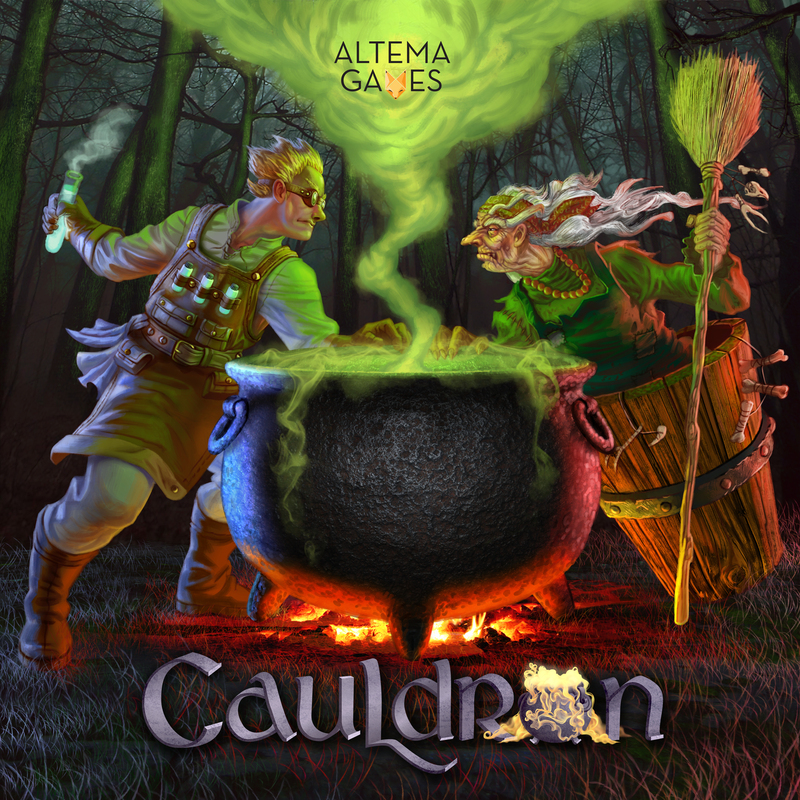 If you want a more dynamic, energetic take with lots of interaction, give Cauldron a look. It’s got a lot going for it. Brew those potions! 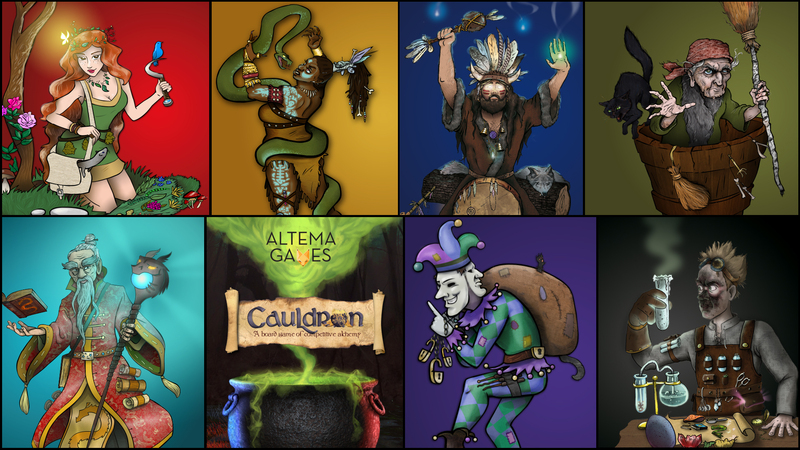 Cauldron is seeking funding on Kickstarter. Check it out! Disclosure: this article is a paid preview. Excellent write up! Played the prototype myself and was blown away how simple yet how deep the game play is. Strategy and resource gathering at it’s best. Good luck to the developers with this project!